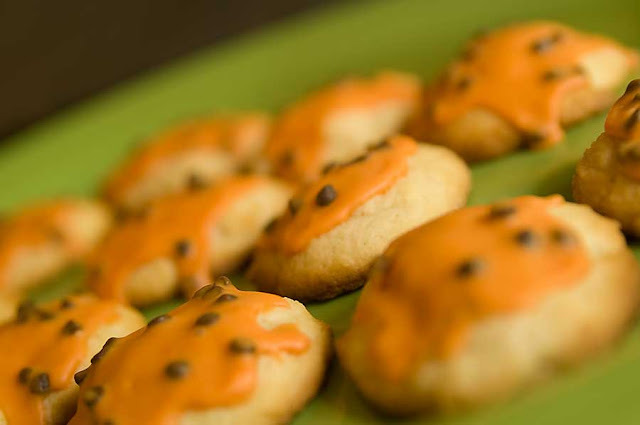 When I was planning this post, I imagined making really cute pumpkin-shaped, prettily decorated sugar cookies, maybe with chocolate chips to make jack-o-lantern faces. As you can see, that's not what happened. I tried a new recipe, and I guess that was my first problem. This recipe called for 1 Tbs of milk. (Milk in sugar cookies? That was a new one for me.) And it's really hard to measure just one tablespoon of milk from a nearly full gallon jug--let's just say, more than one tablespoon got into the cookie dough. But I thought it would be alright anyways. I chilled the dough overnight, and it seemed that it was going to work, but it quickly became too soft for rolled-and-cut cookies. Sigh--no cute pumpkin-shapes for me. So I made them into drop-cookies instead. 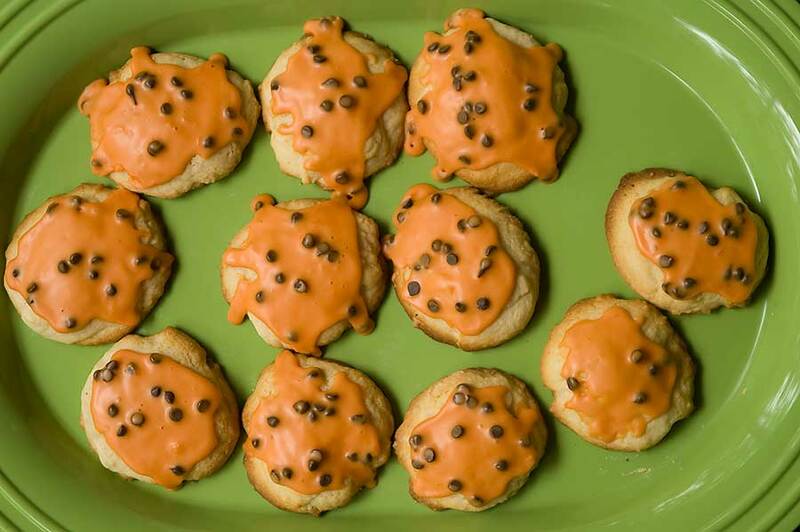 (Drop-cookies = spoon dough onto cookie sheet, in case you're not familiar with the term.) I know you don't usually frost drop-cookies, but I'd made the frosting the night before, and darn it, I was going to have my little orange (though not pumpkin-shaped) cookies. The frosting was too soft for round-topped cookies, and it dripped over the edge. And the frosting hardened too fast to make sticking chocolate chip faces on really manageable with a two year old dividing my attention, so I ended up just mixing the chocolate chips into the bowl of frosting. I was telling myself that Halloween cookies don't need to be pretty, but I still felt kinda bummed about how they were turning out. Failing at my second Halloween project of the year? Sigh again. Then Mr. MadeIt came into the kitchen, wanting to sample one of the fresh cookies. "Hey, they're even fun ones!"